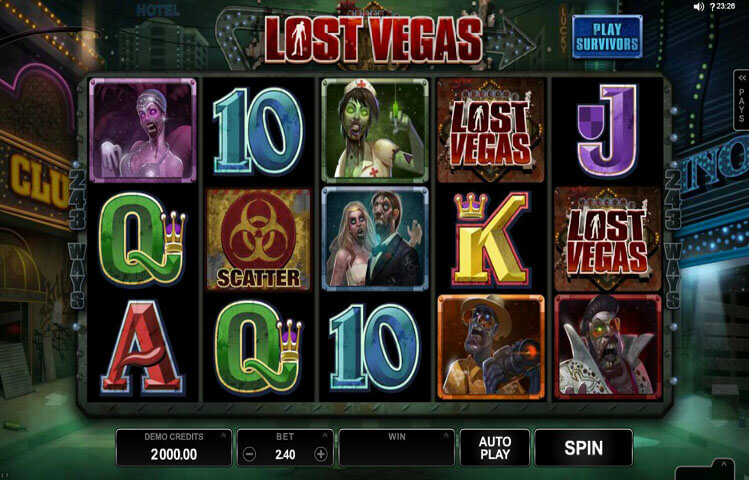 Lost Vegas is the newest Microgaming powered slot machine to be released to the market. The new game has already gone live at many online casinos and it is already proving to be a popular hit. The game takes players on a pretty unique Las Vegas experience. This is because the game does not take players to the Las Vegas strip where they can enjoy the casinos, the slots and the roulette wheels. The game takes players to Las Vegas during the zombie apocalypse. Therefore players will try to survive the city of Las Vegas that is infested with flesh hungry zombie. While they are enjoying this exciting experience, they will be able to claim plenty of rewards. This new game has a 5 reeled setup that is home to 243 ways to win. Through these ways to win, players will be able to claim great prizes. The game creates the exciting and highly entertaining theme of the game through its impeccable visuals. This is something to be expected from a game by Microgaming. If we start with the visuals of the background, players will see that the 5 reels of the game are located in an abandoned Las Vegas casino. This is why players will see abandoned roulette wheels, blackjack tables and slot machineson the casino floor surrounding the reels. As for the symbols that are going to be appearing on the reels themselves, they are also inspired by the theme of the game. They also differ depending on which mode players have chose to play. There is the “Play Zombies” mode in which players will see different flesh eating zombies appearing as symbols on the game’s reels. If players choose the “Play Survivors” mode, instead of zombies, they will see different survivors that they will join throughout the game play. Other symbols appear in both game modes such as the logo of the game, and the high card symbols. The game’s control panel is pretty simple, and it is where players can control the entire game play. This includes placing the bets. They can do that as they go through the betting options at the Bet Cell. They will choose the coin value (0.01 – 0.10) and the number of coins (1 – 15). This results in a betting range that is between 0.30 and 45 credits for each spin. The Logo of the game acts as the wild icon. This means that the logo appearing anywhere on the reels would substitute for other icons to enable players to claim the biggest payout possible. The wild logo cannot replace the other special icon, which is the scatter. The wild can also give generous prizes when matched. The slot also has two randomly triggered bonuses, they are the Zombie Fist of Cash and the Blackout bonus.